If a tropical vacation is your idea of pure relaxation, head to western Florida’s Gulf ofMexico coastline where fall is still perfect beach weather. With 590 miles of shoreline and warm Gulf waters, you might decide to island-hop. The area’s many islands offer gorgeous sunsets, shelling, great dining and picnicking, water sports, boating, biking and exploring. Best known are Sanibel and Captiva islands, connected to the mainland by a three-mile causeway and connected to each other by a bridge. Sanibel is known worldwide for its abundant shelling - more than 400 varieties of shells. Collectors enjoy hours of sun along some of North America’s best shoreline. “Must-see” sites include the J.N. "Ding" Darling National Wildlife Refuge and the 1884 Sanibel Lighthouse. 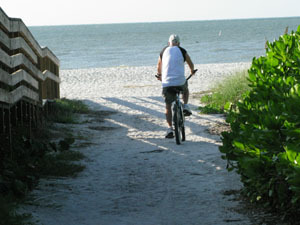 Plentiful bike paths allow exploration of the island at your own pace. Quieter and more remote than Sanibel, Captiva Island’s main attractions are its laid back pace, several great restaurants, sunset views and beautiful beaches. 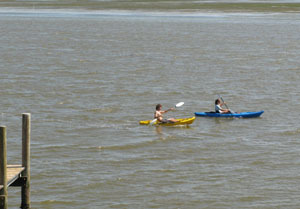 Visitors also enjoy exploring barrier islands off this southwest Florida paradise by land or by boat. Some of the 100 coastal islands are uninhabited mangrove clusters while others impress with their beautiful beaches. Other beach destinations include Estero Island, Pine Island, and Gasparilla Island. 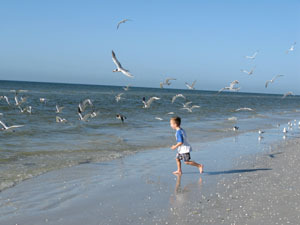 Estero Island, home of Fort Myers Beach, offers soft, white sand. During the winter, Estero Bay is home to an extensive shrimp and fishing fleet. Don’t miss Lovers Key State Park, just south of Fort Myers Beach. Step back to old-time Florida on Pine Island. Accessible by land via "the fishingest bridge in the USA," entertain yourself with several eclectic art galleries, while the Calusa Heritage Trail offers insight into the 2,000-year-old Indian tribe. Accessible by boat and car via a causeway, Gasparilla Island’s charming, turn-of-the-century harbor town, Boca Grande, was founded in the late 1800s. This sleepy, upscale town features small shops, cozy restaurants, waterside accommodations and beautiful beaches. Check out the legendary, 1911 Gasparilla Inn & Club, known for celebrity visits. More adventurous? Hop on a water taxi, rent a boat, or take one of the scheduled services to the outer islands, such as Cabbage Key, North Captiva, and Cayo Costa. Narrated boat or guided kayak/canoe tours provide sightseeing, shelling, sealife encounters, dolphin watch cruises, nature and heritage cruises, and more. We lived in West Palm Beach for a couple of years and tried to get to Sanibel/Captiva at least once every three months. Great seashells and just a wonderful retreat! Thanks for bringing back wonderful family memories!